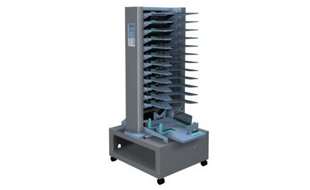 The DFC-101 is a compact and easy-to-use collator. Equipped with three feed rollers and adjustable paper separators. The DFC-101 provides reliable and consistent feeding of a wide variety of fine quality, uncoated papers up to 128 gsm. Double feed and mis-feed detections help ensure the accuracy of the collated set. Collated sets are delivered to the integrated stacker and can be straight or offset stacked. 33" x 25" x 40"
Interested in the Duplo DFC-101? Contact us to see what this Collator can do for your business!